Blizzard has updated their Mists of Pandaria section with a new MoP Talent Calculator. It’s still very early on, so don’t expect any-or-all of these abilities and talents to be set in stone. In fact, I’m hoping there’s still a good deal of finish work left for the class and spec abilities. As far as hunters are concerned, very little has been done with the existing skills. I imagine they will be making a few tweaks here and there, maybe removing a few skills, and introducing a couple new ones. Considering the class abilities only go to 85 in this iteration of the calculator – I’m assuming we’re going to see at least two to three new hunter class abilities added in the next few months. First off, I am really excited about this new expansion. Probably the most excited I’ve been about a WoW expansion… ever. I really like that they’re putting a priority on fun, rather than progression. The fun factor is something that’s been lacking for some time, in my opinion. Don’t get me wrong… the game has always been enjoyable and always will be, I’m sure, but it hasn’t been as much fun as it once was. When I first started playing WoW there was a sense of awe and wonderment that went along with exploring the world of Azeroth. There was a lot less content back then, yet it seemed like there were far more options available, as far as ‘fun’ game play was concerned. Will be a thing of the past..! 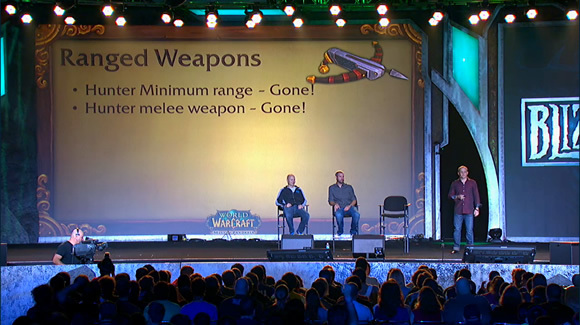 So will melee weapons. Also, Hunters will be the only class to utilize bows, crossbows and guns! The amount and sheer magnitude of the updates and announcements going on at BlizzCon is staggering. I’m sitting here watching the DTV PPV event and screen capping the important bits on my Virtual Ticket – planning to post some of the noteworthy stuff here on the site. About 30mins ago I decided there’s just far too much info coming in to try and touch on all of it. I’ll still be posting and updating existing posts with additional info, but yeah… omg… this new expansion is going to be INSANE!